The correct orientation of the logo is visible on the drink dispenser selections just below the panel with the large letters at the top. Is this an innocent error? Or an act of subversion? With the Dew/Mao part of the logo being the only "little red word" in the design, I would find it hard to believe this is a mistake. Also, I am wondering about the 7-up logo, which seems to replace the Roman characters "up" with a Chinese character. – Does it also mean "up"? – Does the pronunciation of "7" in Mandarin go well with the chosen character's pronunciation in some clever way? For that matter, does the translation of Mountain Dew actually mean anything like "dew from a mountain"? A soda machine in Honolulu in 2005 very near what turned out to be Barack Obama's childhood home had a sign announcing Mountain Due. 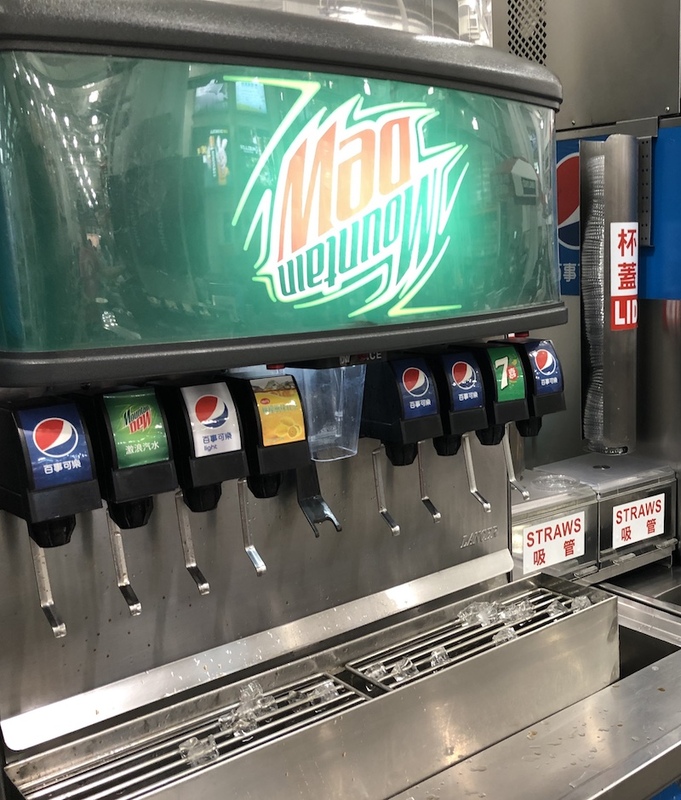 The sign in the picture is symmetrical enough that it could be easy to install the wrong way by mistake, but the "Mao/Dew" switch is funny enough that it's probably intentional. The Chinese edition of Wikipedia says the original Cantonese name for 7 Up in Hong Kong had an unfortunate homophone, so they changed it to 七喜 ( branded with the Western numeral as 7喜），which means "seven happiness." The name carried over when they marketed it in places where other varieties of Chinese were spoken. In Mandarin it comes out qīxǐ, if I've got the tones right. Chee-shee for your English-language broadcaster. I like how the inverted Mountain can be read, with a little modification, as "wet u now". Also, logo inversion has already been done intentionally with 7 Up! The "inverted" drink dnL (discontinued in 2005, but you can still look at pictures and taste test videos) is said to have a similar color to Mountain Dew.